Get ready for a spring-clean… Out with the old winter apparel and in with the new warm weather gear! 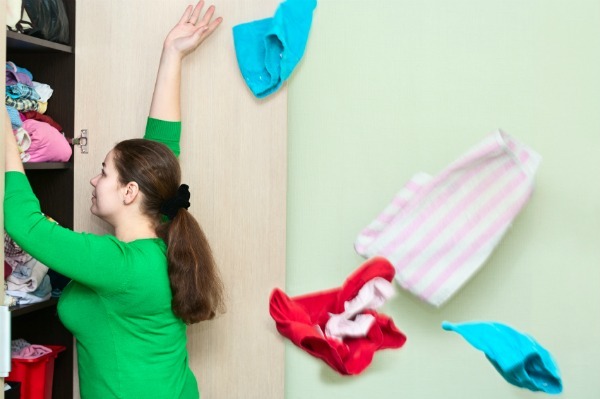 Follow these top tips to clean out that closet and store your winter clothing safely. First, you need to have a thorough clean of your wardrobe and choose which clothes and shoes should stay and which should be stored away for next year. Don’t just store every winter garment — many of your jackets may be able to be worn over tees and singlets. Take every item out of your wardrobe. That means every shirt, pair of jeans and jacket. Wipe down your shelves and get into the hidden corners of your cupboard with a vacuum. Sort your clothes into five separate piles: one for the definitely keep pile; one for the clothes you’re unsure about; one for clothes to repair or alter; one for clothes that no longer fit or you never wear (which can be collected and donated to charity), and one for winter-only clothes that can be stored away until next year. You might need a patient but discerning friend, or at least a good full-length mirror and natural light to help you make your decisions. The keep pile: Hang the clothes you want to keep back in your wardrobe. Either colour-coordinate them, hang them as full outfits, or hang like with like, starting with singlets at the front and moving to winter coats at the back. Decide which part of the wardrobe is easiest to get to and hang the clothes you wear most often in this space. Any soft cardigans or sweaters should be folded neatly and stored on a shelf to avoid losing their shape on a hanger. Jeans can be hung over hangers or folded and stored in a pile. The maybe pile: Move the clothes you’re not sure about to a crate, box or shelf and leave the clothes for another one-to-three months. If you don’t touch them in that time, you’ll know it’s time to get rid of them. The fix-it pile: The same goes for the clothes that need repairing. If you haven’t added that extra button, fixed up the fraying or taken up the hem in three months, you’re better off cutting your losses and getting rid of the extra clutter. The donation pile: Remember that charity bins aren’t for your ruined or heavily stained clothes. It’s important to ensure that the clothes you donate are still wearable. Fold them into durable bags and take them to a charity collection bin or opportunity shop near you. The storage pile: All of those clothes that got you through the chilly days and cold nights of winter can now have a rest and wait their turn until autumn returns next year. Follow the guide below for some great clothes storage ideas that won’t ruin your garments.